Serverless architecture hides server instances from the developer and usually exposes an API that allows developers to run their applications in the cloud. This approach helps developers deploy applications quickly, as they can leave provisioning and maintaining instances to the appropriate DevOps teams. It also reduces infrastructure costs, since with the appropriate tooling you can scale your instances per demand. Applications that run on serverless platforms are called serverless functions. A function is containerized, executable code that’s used to perform specific operations. Containerizing applications ensures that you can reproduce a consistent environment on many machines, enabling updating and scaling. 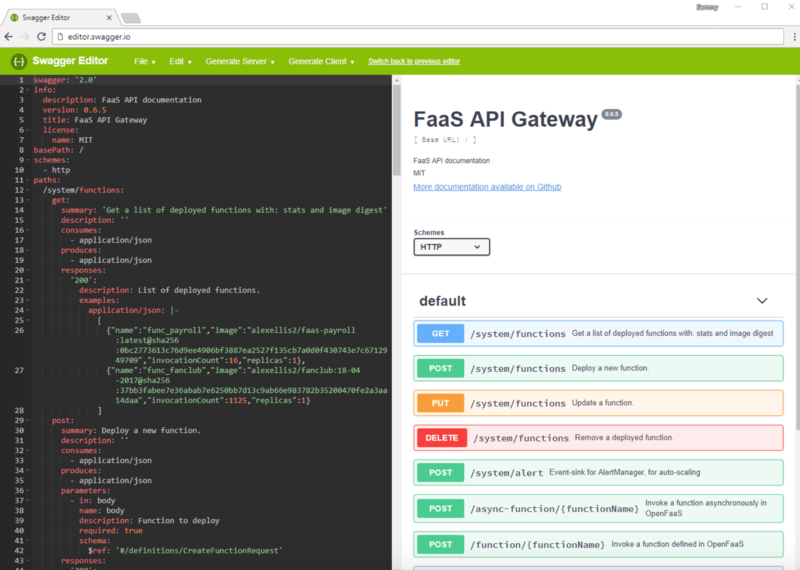 OpenFaaS is a free and open-source framework for building and hosting serverless functions. With official support for both Docker Swarm and Kubernetes, it lets you deploy your applications using the powerful API, command-line interface, or Web UI. It comes with built-in metrics provided by Prometheus and supports auto-scaling on demand, as well as scaling from zero. In this tutorial, you’ll set up and use OpenFaaS with Docker Swarm running on Ubuntu 16.04, and secure its Web UI and API by setting up Traefik with Let’s Encypt. This ensures secure communication between nodes in the cluster, as well as between OpenFaaS and its operators. Ubuntu 16.04 running on your local machine. 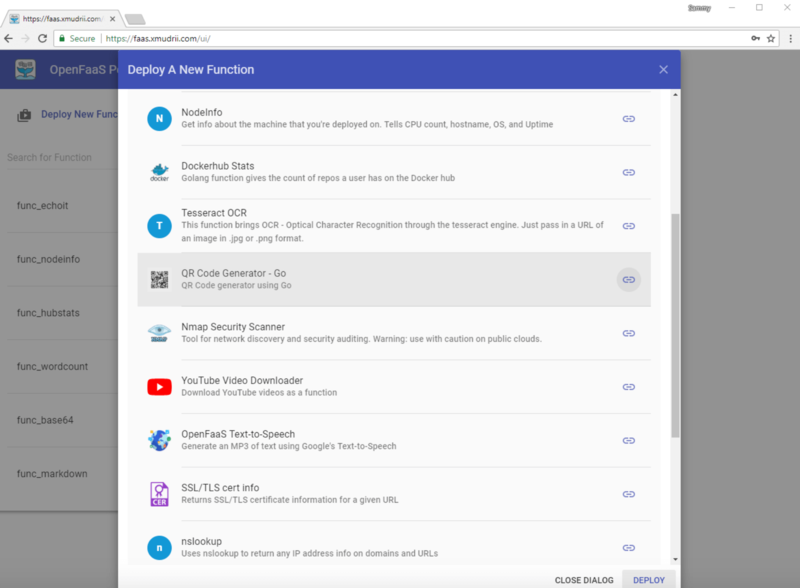 You can use other distributions and operating systems, but make sure you use the appropriate OpenFaaS scripts for your operating system and install all of the dependencies listed in these prerequisites. Docker installed, following Steps 1 and 2 of How To Install and Use Docker on Ubuntu 16.04. A Docker Hub account. To deploy functions to OpenFaaS, they will need to be published on a public container registry. We’ll use Docker Hub for this tutorial, since it’s both free and widely used. Be sure to authenticate with Docker on your local machine by using the docker login command. Docker Machine installed, following How To Provision and Manage Remote Docker Hosts with Docker Machine on Ubuntu 16.04. A DigitalOcean personal access token. To create a token, follow these instructions. A Docker Swarm cluster of 3 nodes, provisioned by following How to Create a Cluster of Docker Containers with Docker Swarm and DigitalOcean on Ubuntu 16.04. A fully registered domain name with an A record pointing to one of the instances in the Docker Swarm. Throughout the tutorial, you’ll see example.com as an example domain. You should replace this with your own domain, which you can either purchase on Namecheap, or get for free on Freenom. 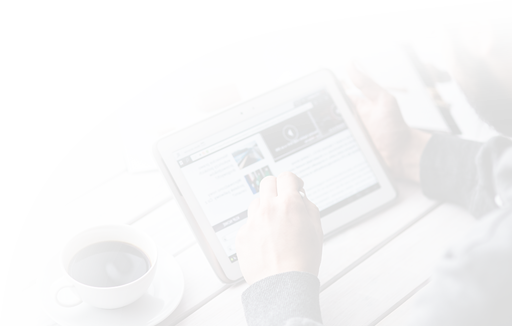 You can also use a different domain registrar of your choice. To deploy OpenFaaS to your Docker Swarm, you will need to download the deployment manifests and scripts. The easiest way to obtain them is to clone the official OpenFaas repository and check out the appropriate tag, which represents an OpenFaaS release. In addition to cloning the repository, you’ll also install the FaaS CLI, a powerful command-line utility that you can use to manage and deploy new functions from your terminal. It provides templates for creating your own functions in most major programming languages. In Step 7, you’ll use it to create a Python function and deploy it on OpenFaaS. For this tutorial, you’ll deploy OpenFaaS v0.8.9. While the steps for deploying other versions should be similar, make sure to check out the project changelog to ensure there are no breaking changes. If you see any errors, make sure to resolve them by following the on-screen instructions before continuing. With the OpenFaaS repository downloaded, complete with the necessary manifest files, let's proceed to installing the FaaS CLI. Creating alias 'faas' for 'faas-cli'. If you see an error, make sure to resolve it by following the on-screen instructions before continuing with the tutorial. Use "faas-cli [command] --help" for more information about a command. You have now successfully obtained the OpenFaaS manifests and installed the FaaS CLI, which you can use to manage your OpenFaaS instance from your terminal. The ~/faas directory contains files from the 0.8.9 release, which means you can now deploy OpenFaaS to your Docker Swarm. Before doing so, let's modify the deployment manifest file to include Traefik, which will secure your OpenFaaS setup by setting up Let's Encrypt. Traefik is a Docker-aware reverse proxy that comes with SSL support provided by Let's Encrypt. SSL protocol ensures that you communicate with the Swarm cluster securely by encrypting the data you send and receive between nodes. To use Traefik with OpenFaaS, you need to modify the OpenFaaS deployment manifest to include Traefik and tell OpenFaaS to use Traefik instead of directly exposing its services to the internet. Note: The Docker Compose manifest file uses YAML formatting, which strictly forbids tabs and requires two spaces for indentation. The manifest will fail to deploy if the file is incorrectly formatted. The OpenFaaS deployment is comprised of several services, defined under the services directive, that provide the dependencies needed to run OpenFaaS, the OpenFaaS API and Web UI, and Prometheus and AlertManager (for handling metrics). The Traefik image is coming from the Traefik Docker Hub repository, where you can find a list of all available images. --docker. *: These flags tell Traefik to use Docker and specify that it's running in a Docker Swarm cluster. --web=true: This flag enables Traefik's Web UI. --defaultEntryPoints and --entryPoints: These flags define entry points and protocols to be used. In our case this includes HTTP on port 80 and HTTPS on port 443. --acme. *: These flags tell Traefik to use ACME to generate Let's Encrypt certificates to secure your OpenFaaS cluster with SSL. Make sure to replace the example.com domain placeholders in the --acme.domains and --acme.email flags with the domain you're going to use to access OpenFaaS. You can specify multiple domains by separating them with a comma and space. The email address is for SSL notifications and alerts, including certificate expiry alerts. In this case, Traefik will handle renewing certificates automatically, so you can ignore expiry alerts. With the command directive in place, let's tell Traefik what ports to expose to the internet. Traefik uses port 8080 for its operations, while OpenFaaS will use port 80 for non-secure communication and port 443 for secure communication. Next, using the volumes directive, mount the Docker socket file from the host running Docker to Traefik. The Docker socket file communicates with the Docker API in order to manage your containers and get details about them, such as number of containers and their IP addresses. You will also mount the volume called acme, which we'll define later in this step. 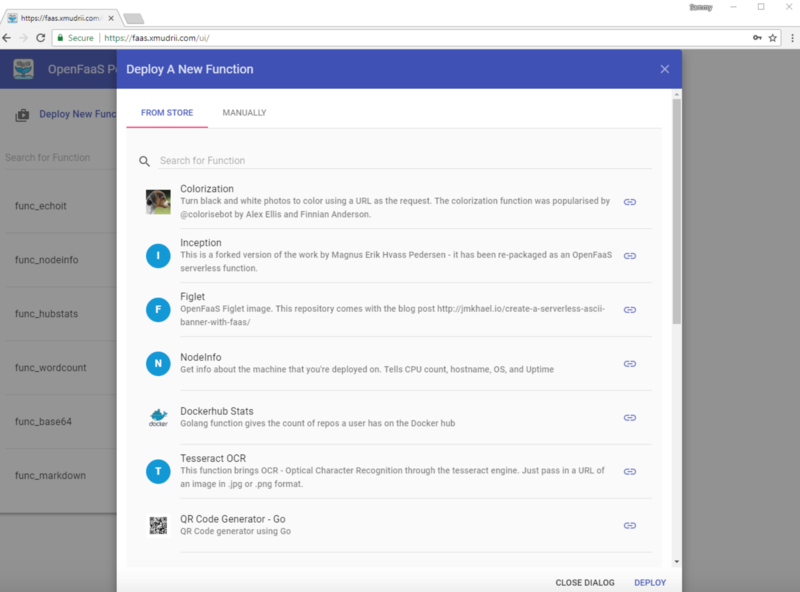 The networks directive instructs Traefik to use the functions network, which is deployed along with OpenFaaS. This network ensures that functions can communicate with other parts of the system, including the API. The deploy directive instructs Docker to run Traefik only on the Docker Swarm manager node. While this configuration ensures that Traefik will be deployed with OpenFaaS, you also need to configure OpenFaaS to work with Traefik. By default, the gateway service is configured to run on port 8080, which overlaps with Traefik. 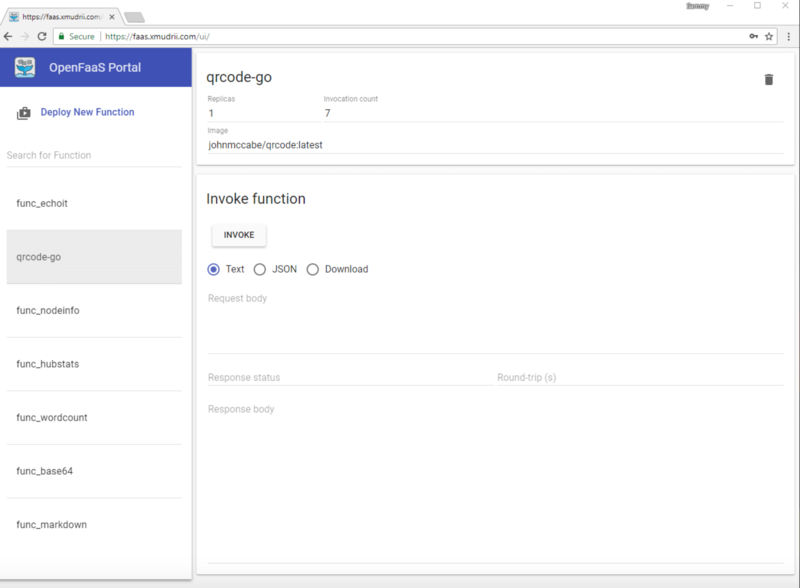 The gateway service provides the API gateway you can use to deploy, run, and manage your functions. It handles metrics (via Prometheus) and auto-scaling, and hosts the Web UI. Our goal is to expose the gateway service using Traefik instead of exposing it directly to the internet. Remove the ports directive from the service to avoid exposing the gateway service directly. The /ui endpoint exposes the OpenFaaS Web UI, which is covered in the Step 6 of this tutorial. The /system endpoint is the API endpoint used to manage OpenFaaS, while the /function endpoint exposes the API endpoints for managing and running functions. Step 5 of this tutorial covers the OpenFaaS API in detail. Finally, let's define the acme volume used for storing Let's Encrypt certificates. We can define an empty volume, meaning data will not persist if you destroy the container. If you destroy the container, the certificates will be regenerated the next time you start Traefik. Once you're done, save the file and close your text editor. At this point, you've configured Traefik to protect your OpenFaaS deployment and Docker Swarm. Now you're ready to deploy it along with OpenFaaS on your Swarm cluster. Now that you have prepared the OpenFaaS deployment manifest, you're ready to deploy it and start using OpenFaaS. To deploy, you'll use the deploy_stack.sh script. This script is meant to be used on Linux and macOS operating systems, but in the OpenFaaS directory you can also find appropriate scripts for Windows and ARM systems. Before deploying OpenFaaS, you will need to instruct docker-machine to execute Docker commands from the script on one of the machines in the Swarm. For this tutorial, let's use the Swarm manager. The deploy_stack.sh script deploys all of the resources required for OpenFaaS to work as expected, including configuration files, network settings, services, and credentials for authorization with the OpenFaaS server. The output shows a list of resources that are created in the deployment process, as well as the credentials you will use to access the OpenFaaS server and the FaaS CLI command. Attempting to create credentials for gateway.. Enabling basic authentication for gateway.. If you see any errors, follow the on-screen instructions to resolve them before continuing the tutorial. Before continuing, let's authenticate the FaaS CLI with the OpenFaaS server using the command provided by the deployment script. At this point, you have a fully-functional OpenFaaS server deployed on your Docker Swarm cluster, as well as the FaaS CLI configured to use your newly deployed server. Before testing how to use OpenFaaS, let's deploy some sample functions to get started. Initially, OpenFaaS comes without any functions deployed. To start testing and using it, you will need some functions. The OpenFaaS project hosts some sample functions, and you can find a list of available functions along with their deployment manifests in the OpenFaaS repository. Some of the sample functions include nodeinfo, for showing information about the node where a function is running, wordcount, for counting the number of words in a passed request, and markdown, for converting passed markdown input to HTML output. The stack.yml manifest in the ~/faas directory deploys several sample functions along with the functions mentioned above. You can deploy it using the FaaS CLI. If you see any errors, make sure to resolve them by following the on-screen instructions. If you don't see your functions here, make sure the faas-cli deploy command executed successfully. 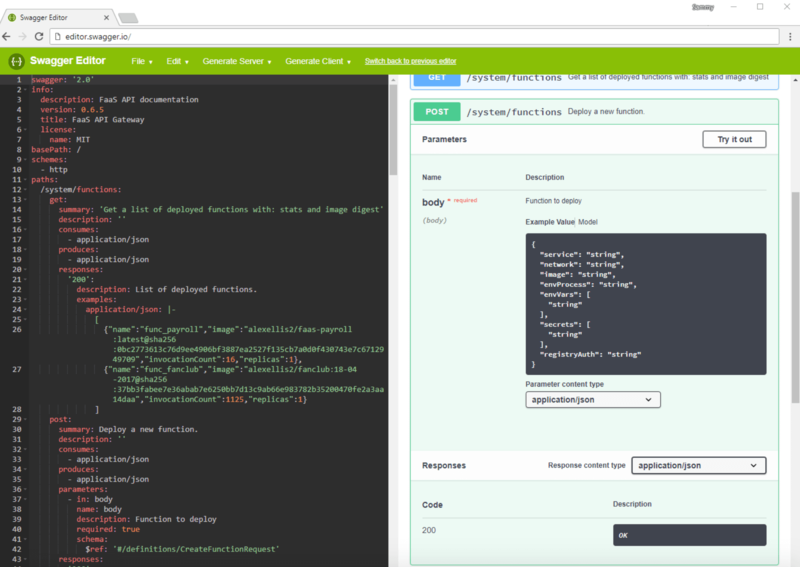 You can now use the sample OpenFaaS functions to test and demonstrate how to use the API, Web UI, and CLI. In the next step, you'll start by using the OpenFaaS API to list and run functions. OpenFaaS comes with a powerful API that you can use to manage and execute your serverless functions. 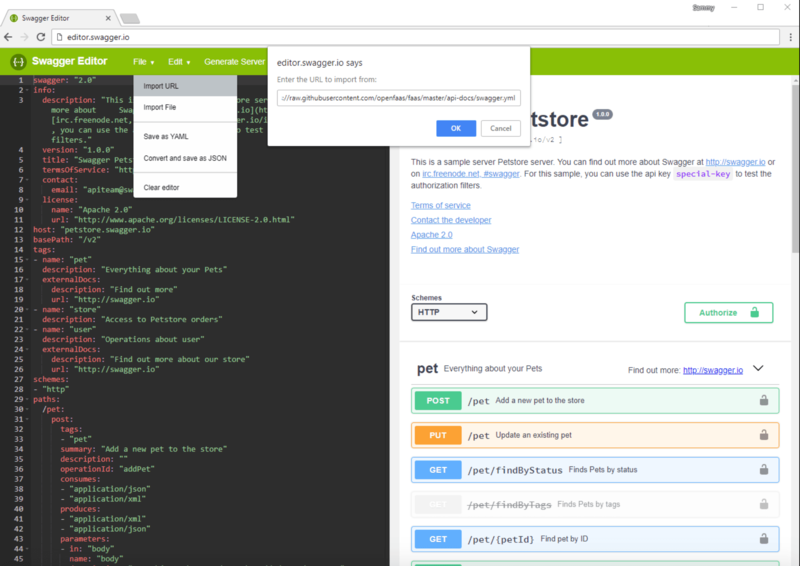 Let's use Swagger, a tool for architecting, testing, and documenting APIs, to browse the API documentation, and then use the API to list and run functions. 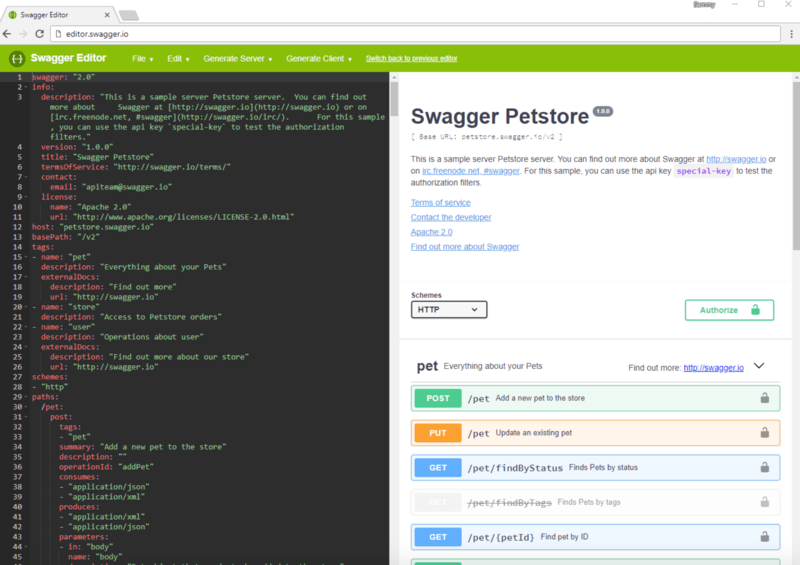 With Swagger, you can inspect the API documentation to find out what endpoints are available and how you can use them. In the OpenFaaS repository, you can find the Swagger API specification, which can be used with the Swagger editor to convert the specification to human-readable form. Here you'll find a text editor containing the source code for the sample Swagger specification, and the human-readable API documentation on the right. 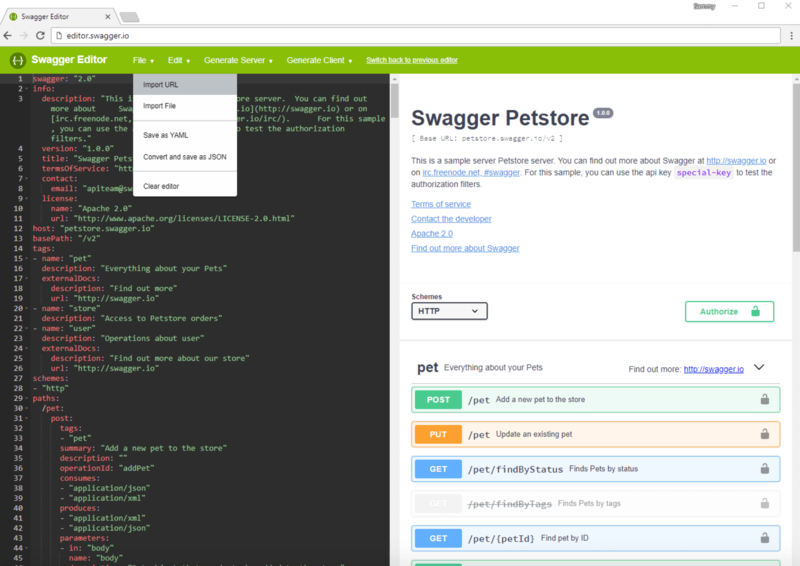 You'll see a pop-up, where you need to enter the address of the Swagger API specification. If you don't see the pop-up, make sure pop-ups are enabled for your web browser. Once you know what endpoints are available and what parameters they expect, you can use them to manage your functions. You can see the required method for each endpoint in the API docs. Let's take one of these functions and execute it, using the API /function/function-name endpoint. This endpoint is available over the POST method, where the -d flag allows you to send data to the function. curl -u admin:your_openfaas_password -X POST https://example.com/function/func_echoit -d "Sammy The Shark"
If you see an error, follow the on-screen logs to resolve the problem before continuing with the tutorial. You can also check the gateway service's logs. At this point, you've used the OpenFaaS API to manage and execute your functions. Let's now take a look at the OpenFaaS Web UI. OpenFaaS comes with a Web UI that you can use to add new and execute installed functions. 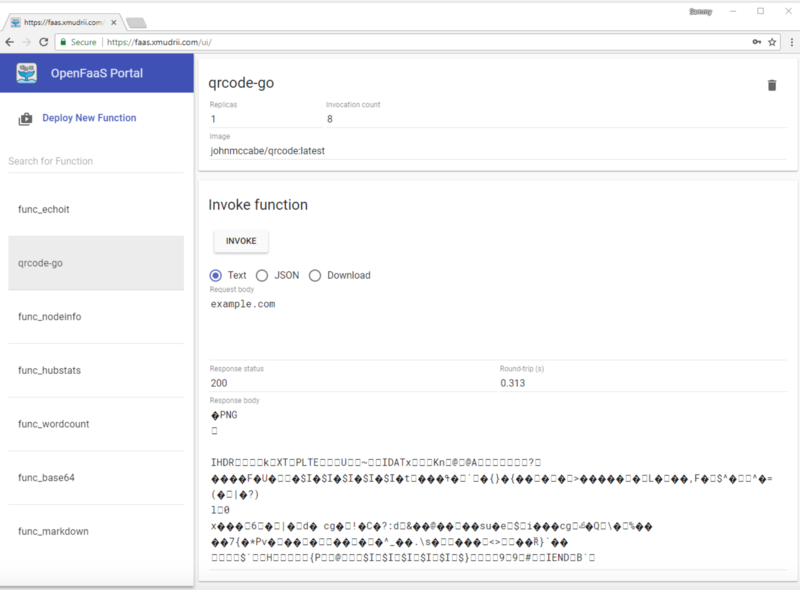 In this step, you will install a function for generating QR Codes from the FaaS Store and generate a sample code. To begin, point your web browser to https://example.com/ui/. Note that the trailing slash is required to avoid a "not found" error. In the HTTP authentication dialogue box, enter the username and password you got when deploying OpenFaaS in Step 3. Once logged in, you will see available functions on the left side of the screen, along with the Deploy New Functions button used to install new functions. In addition to these functions, you can also deploy functions manually from a Docker image. 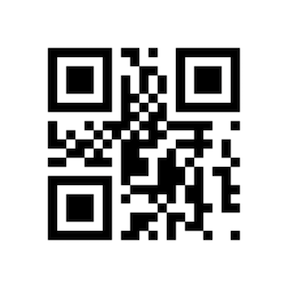 Let's generate a QR code containing the URL with your domain. In the Request body field, type the content of the QR code you'd like to generate; in our case, this will be "example.com". Once you're done, click the Invoke button. In addition to deploying functions from the FaaS store or from Docker images, you can also create your own functions. In the next step, you will create a Python function using the FaaS command-line interface. In the previous steps, you configured the FaaS CLI to work with your OpenFaaS server. The FaaS CLI is a command-line interface that you can use to manage OpenFaaS and install and run functions, just like you would over the API or using the Web UI. Compared to the Web UI or the API, the FaaS CLI has templates for many programming languages that you can use to create your own functions. It can also build container images based on your function code and push images to an image registry, such as Docker Hub. In this step, you will create a function, publish it to Docker Hub, and then run it on your OpenFaaS server. This function will be similar to the default echoit function, which returns input passed as a request. We will use Python to write our function. If you want to learn more about Python, you can check out our How To Code in Python 3 tutorial series and our How To Code in Python eBook. 2018/05/13 12:13:06 No templates found in current directory. The result of the faas-cli new command is a newly-created ~/faas-fucntions/echo-input directory containing the function's code and the echo-input.yml file. This file includes information about your function: what language it's in, its name, and the server you will deploy it on. The directory contains two files: handler.py, which contains the code for your function, and requirements.txt, which contains the Python modules required by the function. Next, let's write a function that will return a request as a string. Once you're done, save the file and close your text editor. Building: sammy/echo-input with python template. Please wait.. Step 4/16 : COPY index.py           . Step 5/16 : COPY requirements.txt   . Step 10/16 : COPY function/requirements.txt . Step 14/16 : ENV fprocess="python index.py"
If you get an error, make sure to resolve it by following the on-screen instructions before deploying the function. You will need to containerize your OpenFaaS function in order to deploy it. Containerizing applications ensures that the environment needed to run your application can be easily reproduced, and your application can be easily deployed, scaled, and updated. For this tutorial, we'll use Docker Hub, as it's a free solution, but you can use any container registry, including your own private registry. Finally, with your image pushed to Docker Hub, you can use it to deploy a function to your OpenFaaS server. If the deployment is successful, you will see a 200 status code. In the case of errors, follow the provided instructions to fix the problem before continuing. At this point your function is deployed and ready to be used. You can test that it is working as expected by invoking it. To invoke a function with the FaaS CLI, use the invoke command by passing the function name and OpenFaaS address to it. After executing the command, you'll be asked to enter the request you want to send to the function. Reading from STDIN - hit (Control + D) to stop. Once you're done, press ENTER and then CTRL + D to finish the request. The CTRL + D shortcut in the terminal is used to register an End-of-File (EOF). The OpenFaaS CLI stops reading from the terminal once EOF is received. Received message: Sammy The Shark! If you don't see the output or you get an error, retrace the preceding steps to make sure you've deployed the function as explained and follow the on-screen instructions to resolve the problem. At this point, you've interacted with your function using three methods: the Web UI, the API, and the CLI. Being able to execute your functions with any of these methods offers you the flexibility of deciding how you would like to integrate functions into your existing workflows. In this tutorial, you've used serverless architecture and OpenFaaS to deploy and manage your applications using the OpenFaaS API, Web UI, and CLI. You also secured your infrastructure by leveraging Traefik to provide SSL using Let's Encrypt. If you want to learn more about the OpenFaaS project, you can check out their website and the project's official documentation.